Posted 5/12/2017 5:09pm by David Paulk. Okay, so, Yes, it will be rainy and cool tomorrow, BUT you will not melt, promise, especially if you dress warm and wear a rain coat. 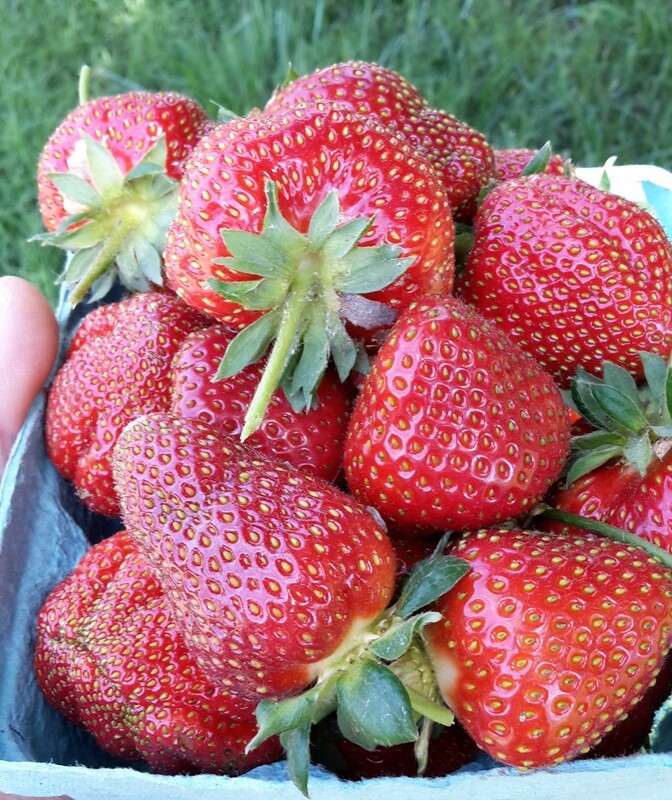 Most importantly, if you don't come to the market tomorrow, you won't get fresh, sweet organic strawberries to enjoy on Mother's Day, which should be a beautiful, warmer sunnyish day! We have a lot more strawberries this week, since we are now at peak season. 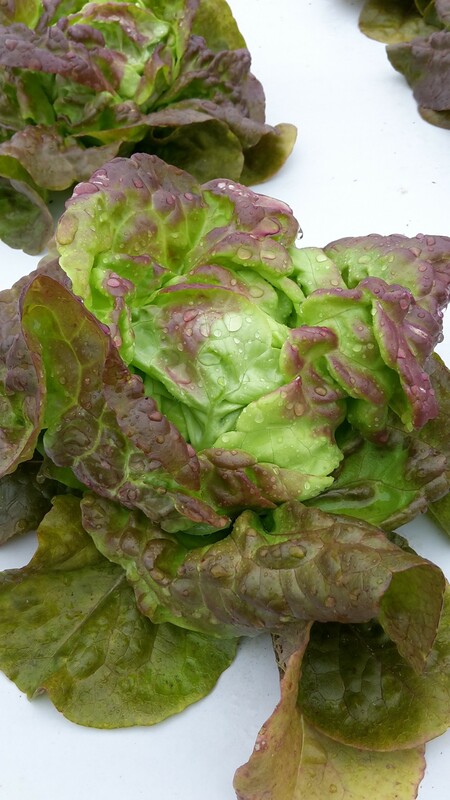 We also have some new spring head lettuces of Bibb (pretty green with soft red colorations) and crispy Romaine. See photos of berries and lettuce below. We so look forward to seeing you tomorrow! - Strawberries (MORE!!! ): We have fresh-picked, red, sweet, organic strawberries for you to enjoy. These are the first flush of the season and are in limited quantity. See photo below. - Lettuce, Bibb & Romaine (New! ): It's the perfect time of year to enjoy so delicious, buttery bibb lettuce that is perfect for making a delicate spring salad or to use in wraps. It is also a great time to enjoy fresh, crisp romaine lettuce in a caesar salad. - Spring Carrots: Fresh, aromatic and crisp carrots. Wonderful lightly roasted, steamed, or sauteed with a little butter. Also tasty grated into salads for fresh carrot flavor, color and nutrients. - Rainbow Chard: Beautiful, glossy leaves and colorful stems. They have just as many nutrients as kale, and you can eat the sweet, crunchy stems! - Curly Kale: This is the kale you are most familiar with that you can use in soups or simply sauteed. Also really easy to use in a kale salad. Just remove stems, cut/tear into bite size pieces, massage with a little olive oil, and then add your favorite dressing. It's that simple. - Lacinato Kale: Also known as "Dino" or "Tuscan" kale. Very tasty kale alternative to the traditional curly kale. It makes great kale chips and salads, among many other delicious uses. - Radishes, French Breakfast: Sure you could eat these for breakfast, but frankly they are good anytime. These are half red and white, tasty crisp radishes. See photo below. - Radishes, Red: Beautiful, deep red and tasty. Of course great on a salad or try with a little butter and salt, which is how German and Eastern Europeans enjoy them. It may sound like an unusual combination, but they really compliment each other. - Spring Mix: Convenient, delicious and ready to eat salad. Perfect blend of red and green butter heads and oakleafs. - Sweet Potatoes, Beuaregard & Murasaki: We have your favorite orange (Beauregard) and purple (Japanese Murasaki) sweet potatoes. They get sweeter in storage and are super sweet now. So, easy to bake whole or slice and roast as sweet potato fries. Posted 5/5/2017 6:45pm by David Paulk. What a difference a week makes?! Spring is usually up and down in temperature, but this is ridiculous. The good news is that our cool season veggies love this weather and we will have the first strawberries of the season, which will likely go fast to the early birds. Don't be afraid of the weather tomorrow; it's not supposed to rain until after the market is done. So, please come by and bring family and friends. We so enjoyed seeing you last week! - Strawberries (New! ): We have fresh-picked, sweet, organic strawberries for you to enjoy. These are the first flush of the season and are in limited quantity. We will have more next week. See photo below. - Radishes, French Breakfast (New! ): Sure you could eat these for breakfast, but frankly they are good anytime. These are half red and white, tasty crisp radishes. See photo below. - Lettuce, Green Leaft and Red Leaf: It's the perfect time of year to enjoy spring crisp green and red leaf lettuces. Posted 4/28/2017 4:52pm by David Paulk. It sure feels like summer, but we're not ready to leave spring just yet, because we have a bunch of spring, fresh organic veggies for you to enjoy. We suggest dressing cool and coming earlier, since it won't be quite so hot. We' really look forward to seeing you all and can't wait to catch up! - Radishes, Red: Beautiful, bright red and tasty. Of course great on a salad or try with a little butter and salt, which is how German and Eastern Europeans enjoy them. It may sound like an unusual combination, but they really compliment each other. - Sweet Potatoes: We have your favorite orange (Beauregard) and purple (Japanese Murasaki) sweet potatoes. They get sweeter in storage and are super sweet now. So, easy to bake whole or slice and roast as sweet potato fries. Posted 4/19/2017 8:20pm by David Paulk. We will be at the Saturday, April 29th BAE Farmers Market (9 am - 1 pm). Meanwhile, the market opens this Saturday, 22 April (Earth Day) and there will be plenty of great vendors there, including Battle Creek, Monnett Farms, Porpoise Creek, Swampfox Farm, and a baker (new! ), to name a few. So, we hope to see you, your friends and family members at the Saturday California ("BAE") Farmers Market this year! We've missed you and can't wait to see you and catch up. We hope that you are all doing very well. Posted 2/19/2017 9:11am by Sassafras Creek Farm. 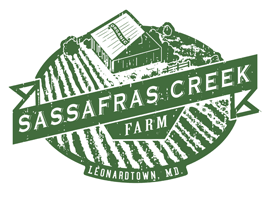 Sassafras Creek Farm is hosting a high tunnel workshop February 23 from 10am - Noon. Come out and learn about growing vegetables year-round in high tunnels. This event is open to the public. See flier for details. Posted 12/11/2016 8:07pm by David Paulk. Swampfox Farm (our friends from BAE Famers' Market) will also be on our farm selling their delicious, pasture-raised, chickens! There's nothing like roast chicken and vegetables for a satisfying dinner with family and friends visiting over the holidays. Please go to our Web site for simple, tasty recipes for all of our produce: www.sassafrascreekfarm.com/recipe. The market will be in a covered space, so don't worry if it is a little rainy or snowy on market day. We'll provide a weather update on Friday, 16 Dec. with the rest of the details, such as farm address and parking. Posted 11/18/2016 4:43pm by David Paulk. Tomorrow will be a beautiful day to celebrate the last market of the season! We'll have lots of certified organic, fresh-from-our-farm produce for your Thanksgiving table. The complete detailed list is below, but some highlights include CELERY, SPINACH, salad mix, beautiful heads of butterhead/bibb lettuce, arugula, kale, chard, Irish and sweet potatoes, beets, radishes, sweet and green peppers, japanese turnips, and ginger! It's been a great market season and it would not have been possible if it were not for you, our wonderful customers! We are so thankful that you have chosen to buy vegetables from our farm. We very much appreciate your support and have so enjoyed getting to know you, your children, family and pets (kale-eating dog, you know who you are)! Please go to our Web site for simple, tasty recipes for all of our produce: www.sassafrascreekfarm.com/recipe. As a reminder, in addition to cash, we take debit, credit and SNAP EBT cards, checks, as well as FMNP farmer's market coupons. - Celery (New! ): Farm fresh celery is such a treat compared to store-bought celery. It is so much sweeter and aromatic. It will make a difference in your Thanksgiving stuffing, roasts, and soups. -Arugula: Of course, mix with salad greens, but also try on a sandwich or on top of pizza, as soon as it comes out of the oven, for a nice kick of spice and healthy greens. - Beets, Golden, Chioggia, Red bunched and topped: Now's your chance to try our wonderful, sweet beets. We have sweet, mild golden beets and your traditional, always good, sweet red beets and the fancy, Italian pink and white bulls-eye beets. Try them out today! - Chard, Rainbow: I love this green. It has such pretty, glossy colorful leaves and it tastes so good. Chard is in the beet family. If you haven't tried it, well, give it a go! Prepared the same as spinach or kale. Simply saute with the tasty, crunchy stems too. Tried sauteed with raisins. Great combo! - Eggplant, Asian: We have beautiful, sweet (not at all bitter) Asian, light purple eggplants that are wonderful on the grill, simply sauteed with other vegetables or used in some very traditional dishes such as eggplant caponata (see eggplant recipes at www.sassafrascreekfarm.com/recipe). - Ginger, freshly-harvested, baby: You have got to see and taste freshly-harvested ginger! It is so pretty, pink, and has a fresh, spicy aroma. It is super tasty and easy to use...no peeling required, because it doesn't have it's brown protective coating on yet. Don't worry about how much to buy, because you can freeze ginger, pull it out of the freezer, grate frozen and put what's left back in the freezer, repeat until gone. None will go to waste! - Kale, Curly & Lacinato: We have plenty of two types of kale to satisfy your craving for greens! Both tasty and can be prepared in the same way, sautee, steam, add to soups, make into chips, use in salads or juice. - Lettuce, butterhead/bibb, romaine and green oak leaf: fresh and sweet - just add a simple dressing; nothing else is needed to thoroughly enjoy. - Oranos Peppers, Orange & Green: We have those sweet, orange peppers that you like so much. We also have green bell type oranos peppers too! - Irish Potatoes, German Butterball and Blue! We have two kinds of tasty potatoes for you to try. Your favorite blue potatoes that are great for roasting or frying, because they turn brown and crisp so nicely. We also have the German Butterball white potato that is similar to a Yukon gold and wonderful in mashed potatoes or boiled. Frankly, they both potatoes are great for many uses. Try both! We have a mix for you! - Sweet Potatoes: In addition to our traditional delicious, orange Covington sweet potatoes, we have purple Murasaki sweet potatoes too. Super tasty simply sliced and roasted for 15 mins at 350 degrees, baked whole like a baked potato, microwaved, or boiled, then mashed; for lunch, dinner, and even breakfast! AND DON'T FORGET SWEET POTATO PIE! - Radishes, French Breakfast and Red: We have plenty of radishes to spice up your salads or just eat like the Eastern Europeans do with a little salt and butter on bread. Give it a try! - Spinach: It seems that no explanation is needed for spinach, except our's is fresh, fresh, fresh, and sweet, slightly nutty, um tasty. - Hakurei Turnips: White, sweet and crunchy Japanese variety of turnips. Wonderful raw in salads like a mild radish or Jicama, or simply sauteed, steamed or roasted. And don't forget the very southern turnip greens! So tasty with or without the bacon. - Tomatoes, heirloom (red): We have a limited quantity of great tasting heirloom tomatoes. - Tomatoes, green: We have some green tomatoes if you would like to make fried green tomatoes or slice thin and use in a frittata. Don't worry about having cash at our stand -- we take credit, debit & SNAP. Posted 11/11/2016 4:57pm by David Paulk. Can you believe the market season is almost over? Tomorrow will be the 30th market of the year, and the following Saturday, November 19 will be the last (just before Thanksgiving). For these last two markets we will have a wide variety of fresh, certified organic veggies for you to choose from! We have plenty of arugula, beets, chard, kale, ginger, CARROTS!, lettuce, onions, potatoes, radishes, spinach, sweet potatoes, turnips, still some tomatoes...and more! Please see the complete list and photos below of what we'll have at market. We so look forward to seeing you, your family, and friends and remember to bundle up tomorrow, it's going to be a bit nippy, but sunny. As a reminder, we take debit, credit and SNAP EBT cards, as well as FMNP farmer's market coupons. - Carrots (New! ): Yes! We have fresh, crunchy carrots! Perfect roasted with potatoes, sweet potatoes, beets and Jerusalem artichokes for a Thanksgiving roasted root dish. - Chard, Rainbow: I love this green. It has such pretty, glossy colorful leaves and it tastes so good. Chard is in the beet family. It truly is my favorite green. If you haven't tried it, well, give it a go! Prepared the same as spinach or kale. Simply saute with the tasty, crunchy stems too. - Ginger, freshly-harvested, baby: You have got to see and taste freshly-harvested ginger! It is so pretty, pink, and has a fresh, spicy aroma. It is super tasty and easy to use...no peeling required, because it doesn't have it's brown protective coating on yet. Don't worry about how much to buy, because you can freeze ginger, pull it out of the freezer, grate frozen and put what's left back in the freezer, repeat until gone. None of it goes to waste! - Lettuce, bibb and green oak leaf: fresh and sweet - just add a simple dressing; nothing else is needed to thoroughly enjoy. - Yellow onions: Essential staple of any kitchen. Taste great and store really well in your crisper. - Rolled Oats (a.k.a., oatmeal): That's oatmeal y'all! Yes, we grew oats on our farm, harvested, milled and rolled them. They cook in the same amount of time as regular Quaker oats...about 10 mins tops. They are mighty tasty too! - Sweet Potatoes: In addition to our sweet traditional Beauregard sweet potatoes, we have purple Murasaki sweet potatoes too. Super tasty boiled and mashed, fried, and roasted; for lunch, dinner, and even breakfast! - Spinach: It seems that no explanation is needed for spinach, except our's is fresh, fresh, fresh, and tasty. - Tomatoes: We have a limited quantity of great tasting heirloom tomatoes, including some green zebras. - Canning Tomaotes: We are selling canning tomatoes at $1/lb. Reserve now and pick up at tomorrow's market! They are perfect for fresh eating, canning, making sauce. It's super, duper easy. You’ll find easy instructions at www.sassafrascreekfarm.com/recipe. To RESERVE 1 or more boxes, please email us at sassafrascreekfarm@gmail.com, and provide your Name, Number of Boxes, Phone Number. We have a limited number of boxes, so it is first come, first serve. We will reply with an email confirming if we have a box reserved for you. Pick-up is at this Saturday's BAE Farmer's Market. If you can pick up by noon, that would be most helpful. Posted 11/4/2016 7:05pm by David Paulk. We will also continue to have a large variety of vegetables (and some new surprises) through the end of the market season. Last market is 19 November, which is the Saturday before Thanksgiving Day. As a reminder, we take debit and credit cards. Please see recipes on our Website (www.sassafrascreekfarm.com) and photos below. - Oranos Peppers, Orange & Green: We have those sweet, orange peppers that you like so much. We also have green bell pepper type oranos peppers too! - Irish Potatoes, German Butterball and Blue and limited quantity of Mt Rose! We have two kinds of tasty potatoes for you to try. Your favorite blue potatoes that are great for roasting or frying, because they turn brown and crisp so nicely. We also have the German Butterball white potato that is similar to a Yukon gold and wonderful in mashed potatoes or boiled. Frankly, they both potatoes are great for many uses. Try both! We have a mix for you! - Sweet Potatoes: In addition to our sweet traditional Beauregard sweet potatoes, we have purple (Murasaki) sweet potatoes too. Super tasty boiled and mashed, fried, and roasted; for lunch, dinner, and even breakfast! - Tomatoes: We have a limited quantity of great tasting heirloom tomatoes. - Green Tomatoes: Tangy, green tomatoes that are perfect fried, made into chutney or added to a green tomato frittata. - Canning Tomaotes: We are selling canning tomatoes at $1/lb. We have a couple 25 boxes and a couple 20 lb boxes. Reserve now and pick up at tomorrow's market! They are perfect for fresh eating, canning, making sauce. It's super, duper easy. You’ll find easy instructions at www.sassafrascreekfarm.com/recipe. Posted 10/28/2016 6:07pm by David Paulk. Tomorrow will be a beautiful, sunny 70 degree day! And no wind to speak of. My goodness, if you were at the market last weekend, you know what I mean...that wind was relentless. Our canopy just about took off several times. So, we are happy to see that the weather will be perfect tomorrow. A great day to visit your friendly farmers who have your week's supply of fresh, certified-organic vegetables. We have a lot to choose from right now. The full list is below, but some highlights are that we are having a sale on kale, as well as sweet, crunchy Hakurei turnips, since we have a lot. We still have freshly-harvested ginger and turmeric. New is Jerusalem Artichokes that taste like artichoky potatoes. And don't forget about our Sassafras Creek Farm-grown Rolled Oats (oatmeal)! We will continue to have a large variety of vegetables through the end of the market season. Last market is 19 November, which is the Saturday before Thanksgiving Day. - Salad Mix (Back! ): Try our tasty, crunchy mix of green and red lettuces that are ready to eat. - Green Tomatoes (New! ): Tangy, green tomatoes that are perfect fried, made into chutney or added to a green tomato fritata. - Yellow onions (New! ): Essential staple of any kitchen. Taste great and store really well in your crisper. - Beets, Golden, Red bunched and topped: Now's your chance to try our wonderful, sweet beets. We have sweet, mild golden beets and your traditional, always good, sweet red beets. Try them out today! - Garlic (in short supply): If you've never tasted our garlic, now's your chance while it lasts. - Oranos Peppers: We have those sweet, orange peppers that you like so much. We have more this week than last, but still limited quantity. The peppers got behind due to the very cold, wet weather we had in May, but the plants are starting to crank 'em out. We also have green bell pepper type oranos peppers too! - Tomatoes: We have a variety of great tasting red, slicing tomatoes to choose from, including heirloom varieties. We also have a few green zebras. Great on sandwiches, in salads, and just sliced on a plate with a little salt, olive oil, basil and maybe some mozzarella. - Canning Tomaotes (3 boxes): We have 25-lb boxes of certified organic regular red canning tomatoes for just $20! What a deal! Reserve now and pick up at tomorrow's market! They are perfect for fresh eating, canning, making sauce. It's super, duper easy. You’ll find easy instructions at www.sassafrascreekfarm.com/recipe.